Today was the anniversary of my dear father’s birth (1910) and death (1996). I don’t know how he managed to enter and exit this existence on the same day, but I think there is something unique, even profound about it. And speaking of coincidences, I know that some of you believe in them and I want to tell you about one that happened to me today that is connected with my father. When I was about 6 my father came home with a book of the Brothers Grimm Fairytales. It’s the only book my dad ever read to me and when he had time, I’d ask him for the same stories over and over again. 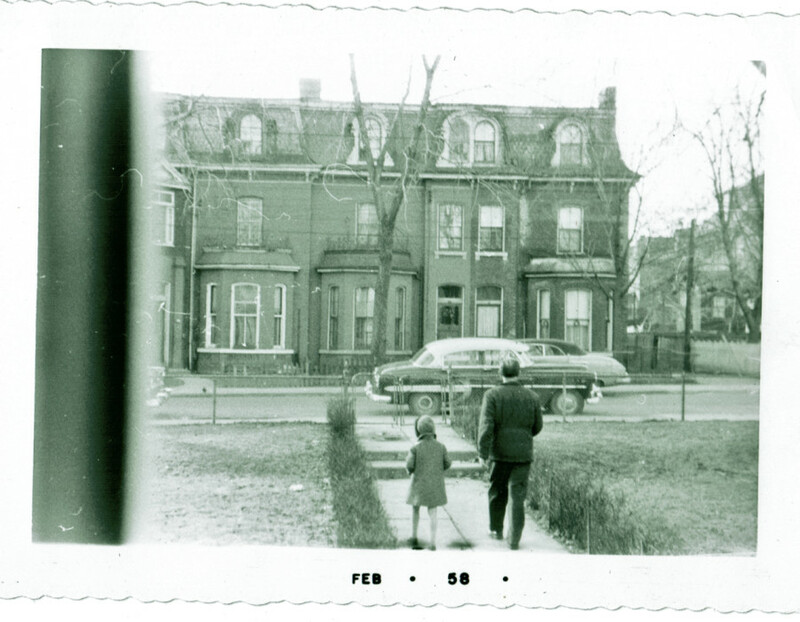 Going for a walk with my dad in Cabbagetown, Toronto. He wasn’t a perfect father and I certainly wasn’t a perfect daughter but we loved each other and I cherish those memories of being read to and still have that book in my collection. Fast forward to February. There was a call for submissions to a community art show in Bear River called “Fairy Tales and Fables”. At the time I was organizing a retrospective and sale of my watercolors and had set aside lots of experimental paintings to use in collages. As well this winter I was frightened by a couple of dogs one of whom had (in my mind) a wolf-like appearance. But did he really? Or was I creating my own fairytale? 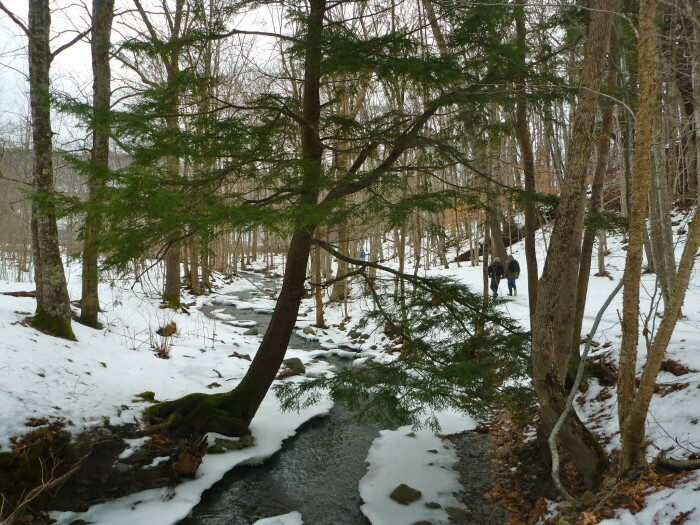 I also took this photograph during the January thaw and I loved the perspective of peering into the woods to see people on a path. Walking down in Kniffen’s Hollow, Bear River. I drew (pardon the pun) from all of these elements to form an idea for my submission to the art show. 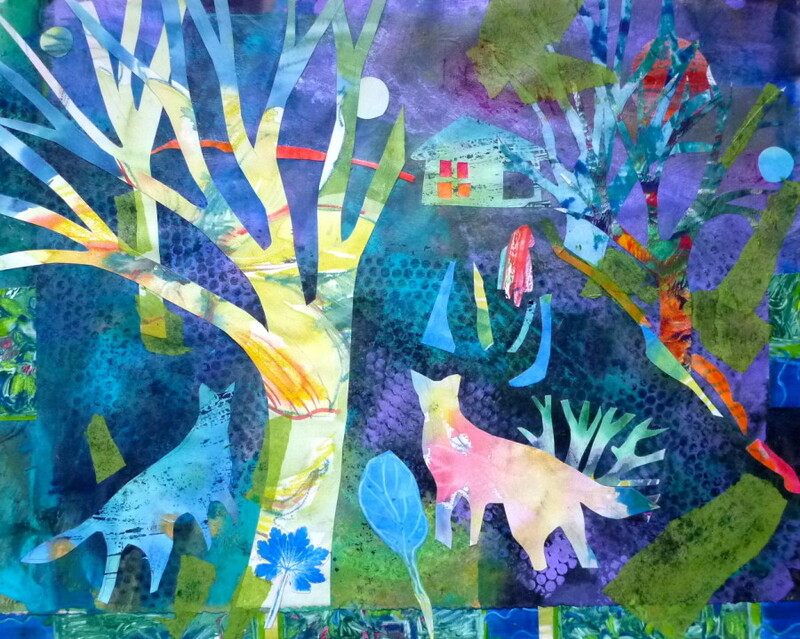 I sketched and cut and pasted a mixed media collection that combined my dog experience with the Red Riding Hood tale. In my version, the viewer of the painting watches the story from a very safe distance, and from the point of view of the predators, which is why I called it “The Ambush”. I had a nightmare as a child that there were 2 suns in the sky. It was terrifying because it presented a dystopia of an alien solar system. For this painting, I put several moons in the sky to ad a surreal feeling to the work. Sometimes our fairytales are self-created. 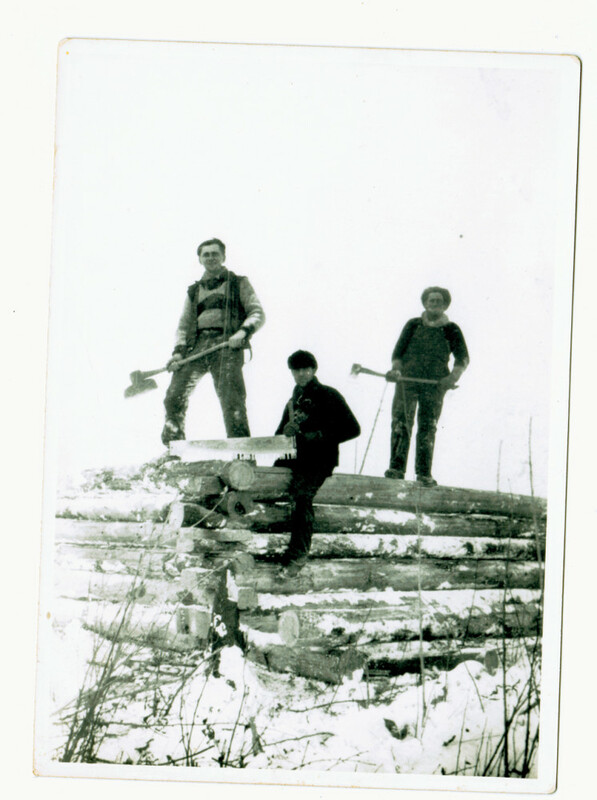 My father’s Canadian fairy tale was about the winter he spent living with his 2 German buddies in a log house they built on their homestead in Alberta in 1931. That experience was so rich for him that he told this story and the details many, many times over until I felt like I had been there. When I was thinking this morning about my father and his brief experience in Alberta, the telephone rang. The caller is originally from out west. And do you know what else? I had forgotten that Red Riding Hood is in my Brothers Grimm fairytale book. Happy Birthday to the man who taught me how to swim, how to tell time and how to imagine a fairy tale. Flora – what a wonderful ending to your personal fairy tale, how beautiful. Obviously your father is still with you on some level. I loved that piece and what a fitting province for it to end it’s journey. Thank you Susan. I see my father (and my mother) and my grandparents too….in me and in the kids. Now I think that’s it’s ironic that my Marxist father ONLY read fairy tales to me. Life is so layered and events are so interesting in retrospect, aren’t they? Flora, thank you for telling the story, or should I say stories, that are so intertwined. I love them, and I really love the painting, and how it came about. The buyer is a lucky person to have it. Love the colours, and everything about it. Thank you Nancy. I hadn’t actually connected all those dots until I sat down to write this. That is probably the gift of blogging, don’t you think? Happy birthday to your father. My father’s birthday was last Friday, and I understand the momentous nature of the day. Congratulations on the sale. Not a surprise it’s a beautiful work. Sally my dog wants you to know the dogs are not scary. They are spirit dogs come to protect you. Great to read the stories. Dogs and cats have their own language and often it is not easy to understand. Great painting also. Thank you Giselle. Like I said, I’ve never had a dog, but I enjoy watching ‘The Dog Whisperer’ and to hear how a person can know how a dog thinks and what the nuances of their behaviour means. 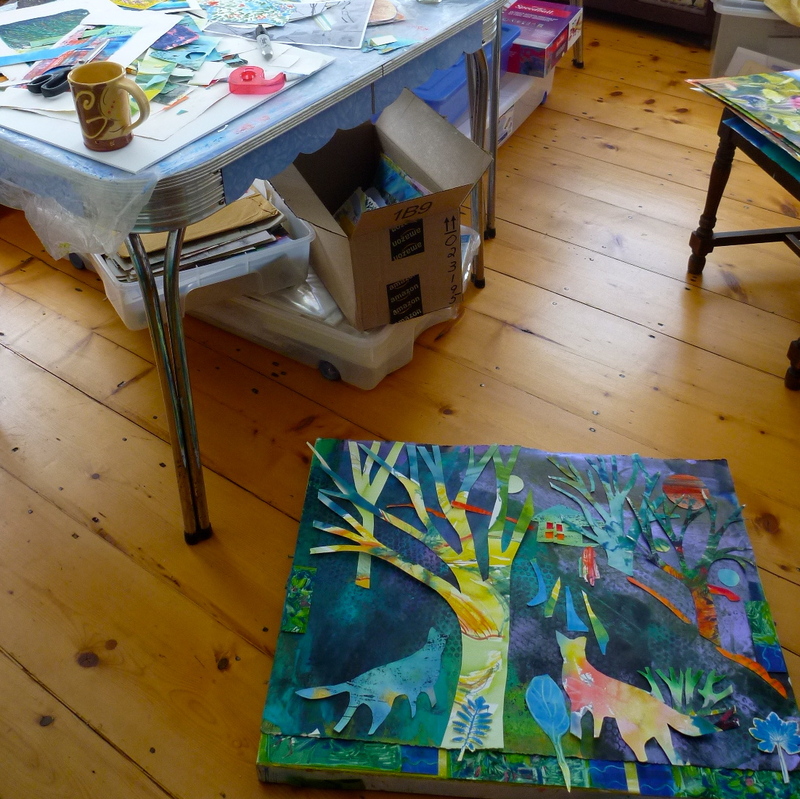 Thanks Tom…..it’s such a shift to use collage and now I’m working on a painting with some collage in it. I have been inspired by your forays into that combination. Your painting has as many layers as your story! Not a coincidence, me thinks. Thank you for sharing with us. Thanks for your comment Sylvia. I’m glad you enjoyed the story! Love your work, and this piece is wonderfully compelling. At first glance I thought, I bet the artist means these 2 German shepherds to be wolves! 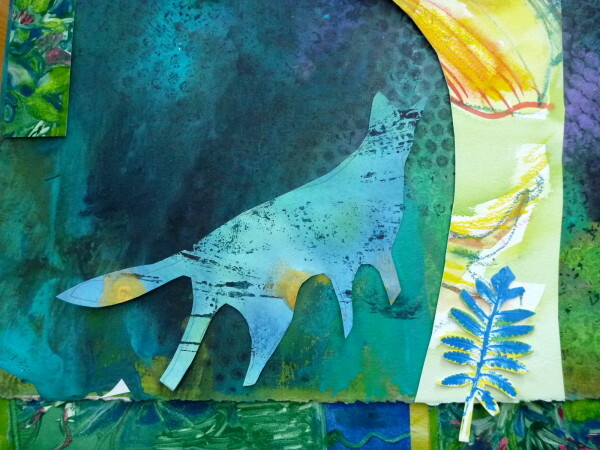 I have such a fondness for wolves, german shepherds and the woods 🙂 … The colours are very soothing, cheerful and inviting as well.